When this arrived for review I could not help but wonder – is it really almost a decade since I first ‘met’ Will and Halt in The Ruins of Gorlan (#1 Ranger’s Apprentice)? Nine years after that first book was published, John Flanagan’s epic adventure series has sold over one million copies in Australia, over eighty million more world-wide across 30 countries, been shortlisted for awards nationally and internationally and, above all, hooked thousands of kids into reading. With each subsequent instalment the legion of fans has grown and each new publication hailed with exuberant excitement and, certainly in my own libraries – countdowns until the day when each devotee could get their hands on a copy! 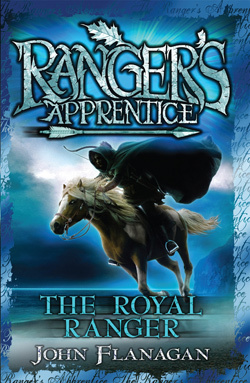 Will and Halt, Horace, Evanlyn, Gilan, Alyss and others have become as real people to readers and many a young boy has dreamed of becoming a member of the Ranger’s Corps. So now we come to the final chapter, and with this last adventure with the Ranger’s brotherhood , young girl readers will be as fired up as their male peers to become a Ranger because for the very first time in the history of the Corps – along comes a girl apprentice! Princess Cassandra (Evanlyn) and Horace the Oak-Leaf Knight are having that wonderful experience of so many parents – a teenage daughter going out of control. Rebellious, self-centred, indulged and wilful, Princess Madelyn – Maddie – has pushed her royal parents to their limit. At the same time, Cassandra and Horace, along with Halt and Gilan, are terribly concerned about Will’s state of mind after the murder of his beloved Alyss. Halt has the perfect solution for the beleaguered parents as well as a plan to bring Will back from the depths of his grief and obsession for revenge. He proposes that Will should take on his goddaughter Maddie as an apprentice. Not without its hitches, the plan is successful on both accounts (perhaps a little too successful according to Cassandra!) and with his usual witty humour, gripping adventures and engaging characters Flanagan takes his readers on one last thrilling adventure when the master and apprentice Rangers embark upon their first joint mission uncovering a dark and dangerous crime conspiracy. No need to urge to buy this one – I know it will be on everyone’s list and quickly off everyone’s shelves! I can’t help but feel a little sad the series is at end but I am sure that John Flanagan will continue to provide his loyal following with more spirited adventures and worthy heroes.